Eat together with your family. Get into the habit of talking with your children every day. The more you know about your children, the easier it will be to guide your kids toward positive activities and friendships. Join Community Connections for Eat Out With Your Family Week, Sept. 5-11, 2017. Proceeds will support local prevention efforts from Community Connections' Substance Abuse Prevention System. 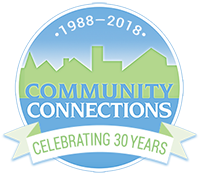 Our 25+ member team assesses issues within Lincoln County, plans programs and practices that address the issues, implements these programs and practices, and then evaluates progress. Almost everyone's life has been touched by substance abuse. Our Substance Abuse Prevention System focuses on combating marijuana use, prescription drug abuse, underage drinking, drinking and driving, methamphetamine abuse, and other harmful drug use. 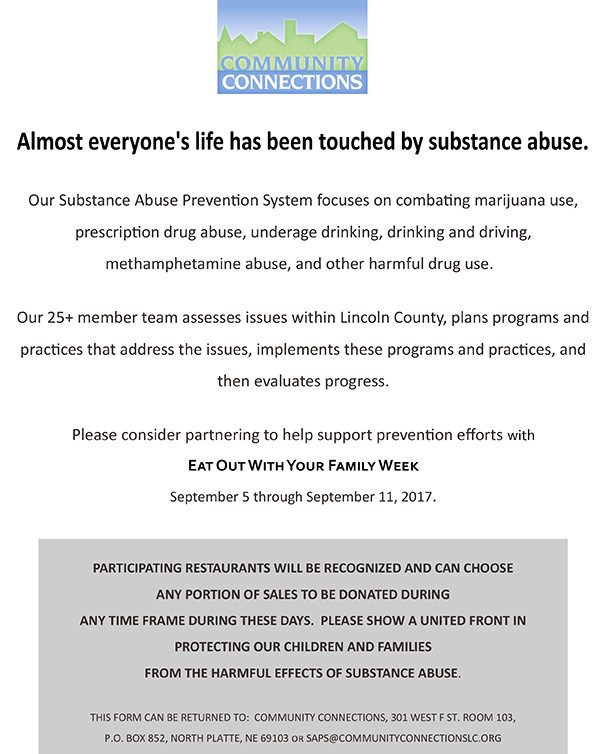 Please consider partnering with Eat Out With Your Family Week, Sept. 5-11. Participating restaurants will be recognized and can choose any portion of sales to be donated during any time frame during these days. Please show a united front in protecting our children and families from the harmful effects of substance abuse. Click the images below to download the registration form, which can be returned to the Community Connections office, or fill in our online form below.